Modern business technologies offer dozens of conflict management strategies. Forbes experts even state that conflicts are vital for productive work. So they are, but on condition that all protagonists can forget the whole thing at 5 pm and go drink some beer with friends at their favorite pub. Meanwhile, confrontations that happen among people who work at sea are the completely different story indeed. Obvious factors such as long hours of hard work, stress, living in unwelcome proximity with other people poison a working atmosphere. It entails exhausting squabbles over working matters or worse bullying, harassment and other forms of an inappropriate behavior. 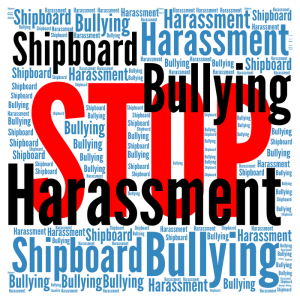 According to Nautilus International statistics 50% of seafarers have experienced some form of bullying, harassment or discrimination at sea. 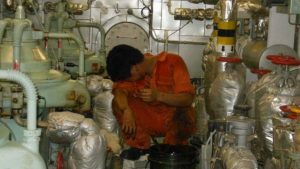 Below we will look closely at the problem of onboard conflicts and ways how seafarers can cope with unpleasant people they get stuck during a trip. Working conflicts. Analyze whether you are battling against a person or a problem. Perhaps aside this particular situation your colleague doesn’t demonstrate such unreasonableness or aggression. If so, separate the person from the problem and tackle your working issue to clear the air. However, it often happens that the opposite opinion of a colleague or supervisor lies at the root of a conflict. Don’t let emotions affect your judgment; there are special procedures for situations when you fear that actions of your colleague might endanger safety of the vessel or ruin your performance:– Document final figures on displays / condition of mechanisms at the end of your watch if you work back-to-back;– If you feel that the order given to you is perversely wrong ask to put it in writing;– Appeal to Master, Chief Engineer or Nautical/Technical Superintendants in case of an argument with Senior Officers. Bullying and Harassment stats. Working issues conflicts, although unpleasant, usually are manageable and don’t lead to grim consequences. Meanwhile, there is still a lot of bullying and harassment onboard. – Cases of abuse, bullying, harassment, and discrimination are massively underreported. Victims prefer to suffer to the end of their trip and ask for the transfer to another vessel or request repatriation under false pretences. – Most common reasons for bullying at sea are: nationality, race, sexual orientation, gender, age and religion. – Officers bully junior members of their crew in the majority of reported cases. – Even “mild” harassment such as jokes or teasing made persistently over several weeks or months can take a toll on mental state and cause depression or damage self-esteem. – Common results of workplace harassment include demoralization, lack of initiative, poor performance, anxiety, depression, loneliness and suicidal thoughts. On January the 8th 2019 new MLC 2006 amendment came into force adding Guidance on eliminating shipboard harassment and bullying to the first paragraph of Guideline B4.3.1 (Provisions on occupational accidents, injuries and diseases) of the Convention. This document was developed by ICS in collaboration with ITF in order to change the situation with onboard violence on the global level. It contains examples of inappropriate behavior, advices on actions in case of bullying and discrimination and provides samples of company policies and procedures for dealing with such cases. Unfortunately, as so many of guidelines these are disconcertingly generic. So, let’s work out more specific plan. Stay calm. It might be extremely hard in a face of blatant provocation, but try to follow this all-time advice in conflict resolution. Just remember that the cooler your mind the more resources you can draw to deal with the situation. Another reason to remain unperturbed when bullied severely is that aggressive people often seek a responsive emotional flash from their victims and switch to an easier target without receiving it. Bully in a Spotlight. Remember that bullies are fundamentally coward and extremely afraid to find themselves in a lime light of workplace harassment; so they deride and discriminate others to avoid it. Therefore, once they get started on you interrupt the flow with an unpredictable, personal or witty question i.e. switch the focus to a bully instead. Humor it all. Quickwittedness is an incredible asset in a battle against troublemakers of any kind. True, it might be difficult to exercise it in foreign language or towards a senior officer, but if it is available for you don’t hesitate to use it. Laughter as the acknowledged tool in resolving any confrontation. Engage others. If you feel that you are unable to cope unaided, speak to other crew members. If there are your compatriots, seafarers speaking your language or representatives of the same religion they might be suffering the same problem. It will be easier for you to tackle the issue together. Never Ignore Discrimination. People in closed isolated community usually prefer turning a blind eye to an unfair treatment of junior members for a multitude of reasons. However, you might be the person who can speak in protection or extend support to a victim. Do not ignore your ability to help. Help of Senior Officers. Depending on the situation on board it might be reasonable to ask for the help of a Master or Chief Engineer as well as onshore management. These are the people designated to deal with any misunderstandings and unpleasant situations among the crew. Reporting the bully. If an informal appeal to senior officers hasn’t brought any change you can make an official complaint. An introduction of “Guidance” into MLC 2006 will make a grievance procedure properly regulated and guarded; meanwhile, similar practice already exists in some companies where HR managers provide support to victims of onboard violence. In any case, talk to the person who is aggressive to you first, otherwise he might state that he was unaware about inappropriateness in his behavior which would weaken your case considerably. A Listening Ear. Aggression and discrimination often leads to isolation of victims. Today many professional charity societies offer 24/7 Support Hotlines for seafarers requiring assistance onboard. For instance, ISWAN has dealt with 80 cases connected with onboard bullying involving 283 seafarers for the first half year period of 2018. 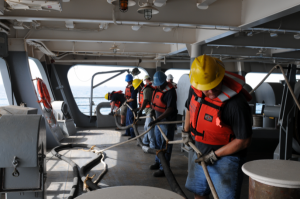 Officers of such seafarers’ societies can either offer a psychological counseling and advice in the individual case or (with the seafarer’s permission) provide an active help. Thus, the complaint of the Indonesian rank about being bullied by Chief Officer and overwork entailed an ITF notification and a visit from Dutch Nautilus International trade union inspector to the vessel initiated by SeafarerHelp officers. The investigation revealed that three more Indonesian ranks were subjected to bullying as well. Moreover, crew wages were delayed systematically. As a result, wages were paid upon PSC query and Indonesians repatriated by their request. Maritime industry has declared a war to aggressive behavior on board. Better working and living conditions, shorter trips also decrease a number of unpleasant incidents considerably. So, despite the fact that it will take years to free ships from the miasma of violence completely, the situation does change for the better.